It began as a simple idea. In the early 1990s Jean-François Cazenave, founding president of Télécoms Sans Frontières (TSF), saw that people displaced by humanitarian crises desperately wanted to speak to their loved ones to let them know their circumstances. "In every refugee camp we visited, people who had lost everything would come in with a telephone number and plead with us to inform their relatives that they were okay," he says. Emergency telecom services were set up during the break-up of Yugoslavia in the 1990s and in Kurdistan during the first Gulf War. But TSF's first official mission was on the border between Albania and Kosovo in 1998, when the organisation was furnished with its first satellite phone. 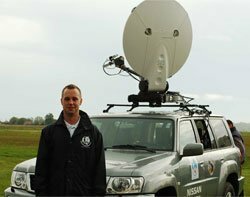 It also worked in Iraq between April and October 2003, providing comms services to humanitarian agencies and civilians. TSF soon found that the international response teams that deploy in emergencies also have a critical need for reliable telecoms in the first days of a crisis. So it expanded its operations, improved its technology, and began to establish rapidly deployable emergency telecoms centres to serve UN, government and charity workers. It quickly gained a reputation for being one of the first to arrive on the scene of a disaster. Usually, it sets up a communications centre, with phones, fax machines, internet, e-mail and laptop connectivity to let humanitarian workers communicate. Conflicts and emergencies often displace civilians and separate families on a massive scale. The affected populations are often left with a destroyed comms infrastructure. Often, people abandon their homes with just a phone number scribbled on a scrap of paper hidden in their shoes. "Everywhere in the world people have a telephone number for someone they know." TSF was set up in 1998 to answer this basic need for communications. During the Kosovo war (1996-1999), TSF gave refugees the chance to make telephone calls. Cazenave recalls, "People went to our telecoms centre to make telephone calls. They did not want food or water." Cazenave describes the services TSF offers as a humanity operation. It enables displaced peope to make a three-minute telephone call for free. "On every TSF mission we have offered a three-minute call to any affected family," he says. Cazenave's aim is to deploy TSF on the ground within 24 hours of being alerted to a humanitarian crisis. Alerts come in from various sources including news websites and the Global Disaster Alert Coordination System (GDAC), which provides SMS alerts and web-based assessment of an affected region based on the vulnerability of the population. A traffic-light system is used to signal the probability for a catastrophic situation with needs for international humanitarian intervention. TSF then monitors the situation and assesses whether emergency communications will be required because the telecoms infrastructrure in the affected area has been damaged. Once the team has arrived, the equipment is up and running within 20 minutes. The TSF crew installs Inmarsat broadband global area network (BGAN) satellite communications kit. These laptop-like devices are highly portable and easy to set up, which is especially important during the first days of an emergency. But bandwidth is expensive, so TSF only uses them for phone, e-mail and basic internet access. Being one of the first on the scene can be useful, says Cazenave, especially if TSF is able to report back on the situation. "When we were in Indonesia we were sent to do an assessment before aid was deployed. You can't just send food to a village if there are wounded people. How can you report that the village needs medical assistance?" Communications is key. "This is the reason our crews are indispensable," he says. With regional offices in France, Thailand and Nicaragua, TSF has supported relief efforts around the world, including Pakistan, Iran, Iraq, Afghanistan, Niger and Chad, and has provided emergency comms in Europe during heavy flooding. TSF teams were deployed in the wake of the Indian earthquake in Bhuj in 2001, the Peru earthquake in 2001, flooding in Venezuela in 2002, the Boxing Day tsunami in 2005, Hurricane Katrina in 2005 and the earthquake in Thailand in 2006, among others. TSF missions are run mainly by volunteers taking time out from university. The volunteers work for around a year on TSF projects. There are also a small number of full-time staff. "All missions are different," says TSF staff member Benoit Chabrier. "In Lebanon, the GSM networks were down, so we set up a satellite communications link so people could call their families, This provides a kind of psychological help they can ask for help, money, clothes, official papers, anything." TSF volunteers are usually network and telecoms undergraduates, because they can offer the most up-to-date skills. In the field, volunteers are not only expected to set up the emergency communications links, but also act as the PC support desk to help humanitarian workers get their computers up and running. Mathieu Frappier, has just finished an 18-month stint at TSF as a volunteer and is studying for a part-time degree in telecoms. He was deployed in April to the Solomon Islands to support the tsunami relief effort, and also during the Mexican fires in September 2007. Frappier says there is a real sense of a student campus-like atmosphere at TSF head office, which is located in a former dental clinic in the city of Pau, south west France. "There are a lot of students here at TSF. It's like a big family." Like the majority of volunteers, Frappier is in his twenties. He is planning to come to the UK this summer to study English, and wants to work with the UN as a specialist in networking and telecoms. People seem to work long hours, even between missions says Fabien Doleac, a telecoms graduate, who has been at TSF for about a year. Doleac spent time in Nicaragua setting up a communications centre for humanitarian workers. "You can't simply just stop working. We have to keep TSF running," he says. The numerous challenges in providing telephone services for refugees and a communications centre for humanitarian workers include the disaster zone lacking electrical power for the satellite equipment. But the TSF crew come prepared. They charge batteries from the car they drive into the affected area. The car battery can also be connected to a power inverter, which provides mains electricity for the equipment. If the team is lucky, they may be able to find a working generator, but since the car and the generator require fuel, TSF has to establish a permanent electricity supply quickly. Even so, its equipment will run for two days without a fixed supply. The crew may be unable to determine the location of the communications centre satellite in advance. Satellite equipment needs to be oriented in such a way that the dish has unobstructed line of sight with the satellite. "You can't have the communications centre located in the east if the satellite faces west," TSF staff member Oisin Walton points out. Trees may also obscure the office, so the positioning of the satellite dish can only be determined once the crew arrive on site. But even after power, location and other technical challenges have been overcome, the real work for the TSF crew only begins once communications are up and running. For instance, the team also has to handle wrong phone numbers. Sometimes people come into the camp and they do not have the country code for the person they want to call or the number is wrong. Walton says it is very difficult but the team can often make an educated guess. TSF can find missing digits from a phone number by looking up region codes in a phone directory, but Walton says it is not always possible to find a number. "In Mozambique, older people did not have phone numbers. They only gave us addresses." The problem for TSF is that there is no worldwide directory services available over the internet, which makes it hard to track down a phone number just from the postal address. And sometimes the people being called are simply unavailable or the phone is engaged and refugees have to leave a voicemail, which leads to more problems as TSF volunteers may only be in a camp for one day before moving the communications centre to another site. Incoming call volume can also disrupt TSF's efforts. People expect to be able to make a call but incoming calls block the line. "When we were in Kosovo in 1999 we received 1,200 calls a day," recalls Cazenave. "Inmarsat said we had saturated its satellite." And when TSF moved to Turkey in 1999 to support the earthquake relief effort there, it was still receiving calls from people calling from England trying to contact Kosovo. Luckily, people soon discover from their phone bills that calling a satellite phone is expensive, so incoming calls soon become more manageable. Once basic comms have been established in the communications centre, TSF sets up a system that can handle larger volumes of calls and internet bandwidth. This requires VGAN satellite equipment, a large piece of kit that requires a licence to operate. It normally takes around three weeks before VGAN can be deployed in an affected area. TSF will set up a VSAT (Very Small Aperture Terminal) once the relief co-ordination centre is up and running. The equipment is used by non-governmental organisations (NGOs), UN agencies like the World Food Program, the World Health Organization, the United Nations Development Programme, local authorities, health and education departments and sometimes the military. Cazenave sees VSAT as part of the long-term recovery plan for an affected region. The equipment is often left behind when TSF leaves. TSF has several corporate sponsors including Inmarsat, Eutelsat, Vzada, AT&T and Cable & Wireless. Between them, they provide TSF with mobile and satellite telecoms facilities. Nissan has also provided a four-wheel drive vehicle. In October 2006 the United Nations Foundation and the Vodafone Group Foundation, announced they would give TSF $2m over five years. Their support has enabled TSF to maintain regional operations that support round-the-clock disaster monitoring, and staff - including volunteers that have been recruited and trained in-region - who can be deployed within 48 hours anywhere in the world that disaster strikes. The funding also allows TSF teams to co-ordinate relief efforts with the UN Children's Fund (Unicef) and the UN Office for the Coordination of Humanitarian Affairs. Cazenave hopes TSF will receive more funding. "Over the next 12 months we'll continue to respond to emergencies." He says he is often asked how come TSF needs to operate continuously. Are there really so many disasters that it need to keep running full-time? Cazenave thinks so. "We have been deployed 350 days a year," he says. With the support of six satellite and telecoms operators, Cazenave's priority is not getting more equipment, but more money. "I'd like to appeal to the telecommunications industry to support our humanitarian work, in the same way the pharmaceutical industry supports relief efforts," he says. Funding will not only support more relief efforts but allow TSF to buy more airtime from the satellite and mobile operators that fund TSF. That may seem an odd need given the corporate support from the telco sector, but Cazenave says it allows TSF to buy airtime at a preferential rate. And given he already has telecoms support, Cazenave would like funding for laptops and software from IT suppliers.